Correcting/Updating a User's Information – How can we help you? When any user account is created, an email address, first name, last name, and password is collected. 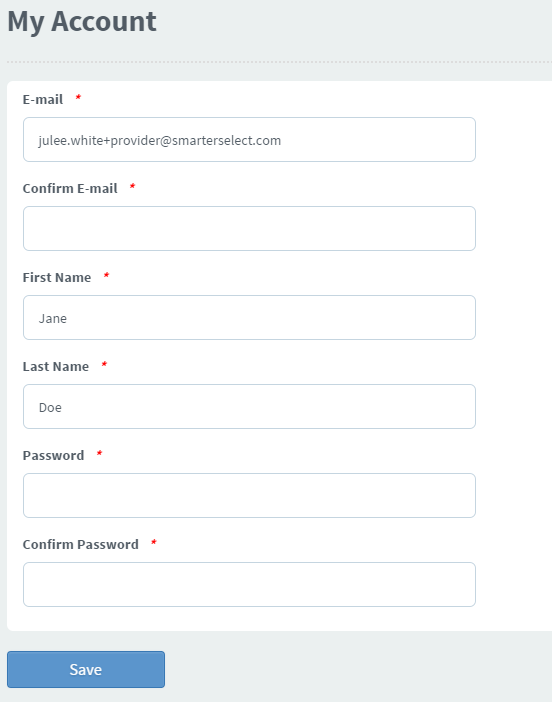 When any corrections or updates need to be made to this information, either the user or SmarterSelect Support can do this. For the users, all that needs to be done to correct this information is log into their account and click "My Account" in the Navigation Bar at the top under your name. To correct/update their name or phone number, just enter the correct information and click "Save". To correct/update their email address or their password, they'll need to enter their their email address or password twice and click "Save". If the user has forgotten their password or is unable to login to their account, they should click on "Forgot Password" on the login page. Here, they'll enter their account's email address. An email will be sent to that email address with a link to create a new password and log into their account. If the user claims that their email address is not recognized, you should check their exact email address in the Users table. Note: Request contacts/recommenders do not create accounts. If one asks you how to login, redirect them to the link in their request email. Request contacts/recommenders will never be asked to create an account.